Florida International University (FIU) is seeking a business partner to develop and commercialize novel therapeutic interventions against HIV-Associated Neurocognitive Disorders (HAND), and particularly, in HIV patients using cocaine. on have been inextricably linked, and neurocognitive dysfunction is enhanced in HIV patients that are ingesting cocaine and other drugs of abuse. Cocaine causes neuronal impairments as well as increases the incidence and severity of HAND. Despite significant therapeutic advances made in the management of HIV, effective treatments against HIV infection in the brain and the pathogenesis of HAND remains a tremendous task. FIU inventors have developed formulations and methods based on bifunctional plant molecule, Withaferine-A (WA), which can eradicate HIV and remove neuronal amyloid beta (Aβ) protein. 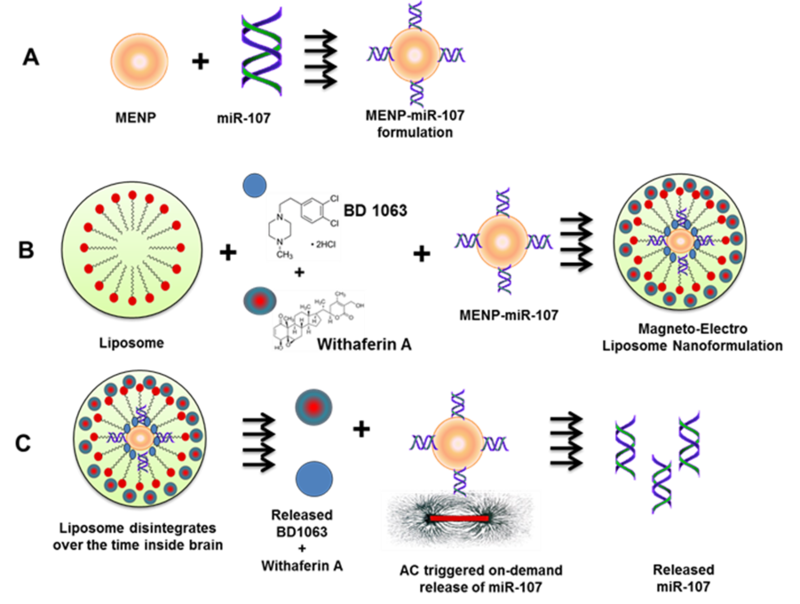 The formulations comprise magnetic nanoparticles (MENPs) encapsulated with liposomes, and conjugated to or mixed with therapeutic cargos comprising an HIV inhibitor (WA), an inhibitor of beta-secretase 1 (BACE-1) activity or expression, and a cocaine antagonist. Because of the high magnetic moments of the MENPs, the formulations can deliver therapeutic cargos to desired body areas including across the blood brain barrier (BBB) via the application of noninvasive external magnetic forces. The components of the therapeutic cargos are then sequentially released from liposomes via biodegradation or diffusion, and alternating current (a.c.) trigger stimulation.